What are your goals for your team or club in 2015? Are you in need of an injection of expertise? Or maybe it is just time to learn some new techniques or drills. The "Go Up A Notch" coaching clinic is an excellent way to accomplish your dragon boat coaching goals. Please join High Five in welcoming award-winning, world championship coach, Bob McNamara, for a very comprehensive weekend coaching seminar. 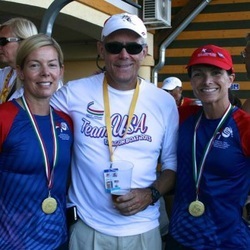 Coach McNamara has been coaching USA dragon boat teams for 30 years, and his teams have won over 100 medals including 23 gold medals at IDBF World Championships. He began as a paddler in the 1984 and 1985 dragon boat team representing the US in the Hong Kong international races, before being asked to coach and proceeding to win two national championships. Coach McNamara is still an active paddler in outrigger and marathon canoe and has raced in every world championship to date. He has taken paddlers with no experience from the novice level to the World Championships! Please click "Buy Now" to complete your registration by credit card or PayPal account. If you are paying by credit card, but do not have a PayPal account, please select the second option on the next screen to pay without an account.